When I retired from the newspaper business, my wife and I moved from Phoenix to Asheville, N.C. It was a big shake-up in our lives. There were lots of adjustments we had to make. When we moved, one of the the biggest problems I faced was getting rid of CDs. I had thousands. We also reduced the books by four fifths, but the CDs caused me more heartache. I had been the classical music critic for my newspaper and I had an amazing collection of music. I felt that I needed to cut my CD collection by at least two-thirds. Part of this was made easier because in retirement, I think differently about the collection. I once felt deep in my bones that I needed to have a recording of everything that was every composed, and that in mainstream repertoire, I needed to have the spectrum of performance practice and styles. At peak, I had 18 different sets of the complete Beethoven piano sonatas, and 27 sets of the late sonatas (counting those in the complete sets). You want Solomon Cutner? I got’im. Want Mieczyslaw Horszowski? Got’im. Ashkenazy? Arrau? Baremboim? Yeah. Wilhelm Kempff? Two sets, the early mono set and the later stereo recordings. And, of course, Artur Schnabel. Could never do without those. If I had to have only one set — and idea not conceivable in this universe — it would be Schnabel. But this lunacy continued through most repertoire. I don’t know how many sets of Mahler symphonies I once owned. I daren’t actually count’em. I had Bruckner out the wazoo, and Stravinsky — well, I owned nearly everything by him ever recorded, at one point. The winner in this competition was the Beethoven Violin Concerto. I had more than 50 recordings of it, including one each on flute and clarinet, and versions on authentic instruments and electric violin. It was insane, and yes, I had listened to all of them, most with score. Let’s say, it is a piece I know well. While packing to move, I put on my most stingy hat, and said, I really only need one of everything, and that, only for the mainstream repertoire. Do I really need all of Boccherini’s string sextets? Do I really need all of Field’s nocturnes? So, they went into the giveaway box. In Phoenix, I had three walls covered with bookcases filled with CDs. Here in Asheville, I have only most of one wall covered. It was painful. But in the years I have left, how many of those obscure CDs would I actually listen to? When I was working, I felt I had to have them in case a visiting string quartet came to town and programed a Miaskovsky string quartet, and I would need to be able to listen to it before reviewing the concert. To say nothing of glossing the CD notes for info. There is actually some stuff I don’t have stored in the old cerebral file cabinet. So, one of each, not 10 of each. But. And this is the problem. But. But, can I really have only one set of Beethoven quartets? And if so, how could I possibly decide between which of my children I would keep. There’s the old Budapest set, the tremendous mono set by the Hungarian Quartet. The Emersons are really good. And the Guarneri. I can’t leave them behind. I probably listen to the Guarneri more than any others. Yes, I can give up the Tokyos. They play the music too smoothly. All the difficulty has been ironed out of the music, and if the Beethoven quartets don’t sound difficult, they’re not the Beethoven quartets. But there are the Cleveland Quartet recordings, too. What a problem. And the Fine Arts Quartet. Not a great recording, but I have sentimental affection for them, since, in an old bargain Murray Hill box set of LPs, they were the first complete set I owned, back when I was a student. Well, I wound up with two sets of Budapests — one commercial recording and one set from the Smithsonian concerts — the Guarneris, the Hungarians and the Emersons. I reluctantly said bye-bye to the Clevelands. There are other single disc recordings of individual quartets I had to keep, too, by the Busch Quartet and Yale. But then, after we moved, I found a set of the early mono Budapest recordings available by mail order. I had to buy them. (Sony, which now owns the old Columbia Masterworks recordings, had only released on CD the later stereo Budapest recordings, which are often embarrassing and in bad intonation. So, to have the mono recording set, made in the 1950s, was a must.) This set is now my constant companion. Aside from some of these catalog entries, which are the core of my musical being, I really was a good boy, and really did ditch a Noah’s Ark-load of my collection. I now have only two complete sets of Haydn symphonies. Only one complete set of Haydn quartets. Which brings me to the point of this note. The Beethoven symphonies. Certainly, for 150 years, they were at the center of the core of the heart of the classical repertoire. Every conductor worth his salts had recorded a set of them, had played them in concert a billion times. They were the one true test of a conductor’s mettle. One might specialize in Sibelius, or another in Mozart. But how does he do Beethoven? That is the question. The problem with this centrality has been, of course, overexposure. There are time when you feel if you have to hear another goddamn Beethoven’s Fifth, you will pull out your 30.06 and look for a tall tower to climb. Da-da-da-DUMB. Strangely, though, in the past couple of years, I’ve had a rebirth of interest in the Big Nine. I can’t explain it, other than, after all, they are genuinely great pieces of music, every one of ’em. And letting them lie fallow for so many years, meant I could approach them again, in Nietzsche’s words, “again for the first time.” Then too, I am more mature now, and I can hear more in the music. Twenty years ago, I felt I had enough of them, and rather ignored them in favor of Mahler, Bruckner, Wagner, Schoenberg (yes, I actually love Schoenberg, with the same warm feelings I have for Mozart) or Schubert. Or Debussy — for a while I was Debussy crazy. But, through it all, the Beethoven symphonies maintained a kind of emotional, intellectual and musical solidity that I could not gainsay. And my CD collection reflected that. I had more than a dozen complete sets, and uncounted individual recordings. They ranged all the way from the depressingly uninflected recording of the Fifth made by Gunther Schuller, who set out to prove that Beethoven’s music should not be “interpreted,” but only played straight through, by the notes, through to the other end of the spectrum, where Sergiu Celibidache drew the music out to absurd lengths of interpretive shenanigans. I had to get rid of an awful lot of those recordings. I felt an almost Protestant virtue in denying myself. It was mortification of the ears. Yes, get rid of Klemperer, get rid of Bruno Walter. 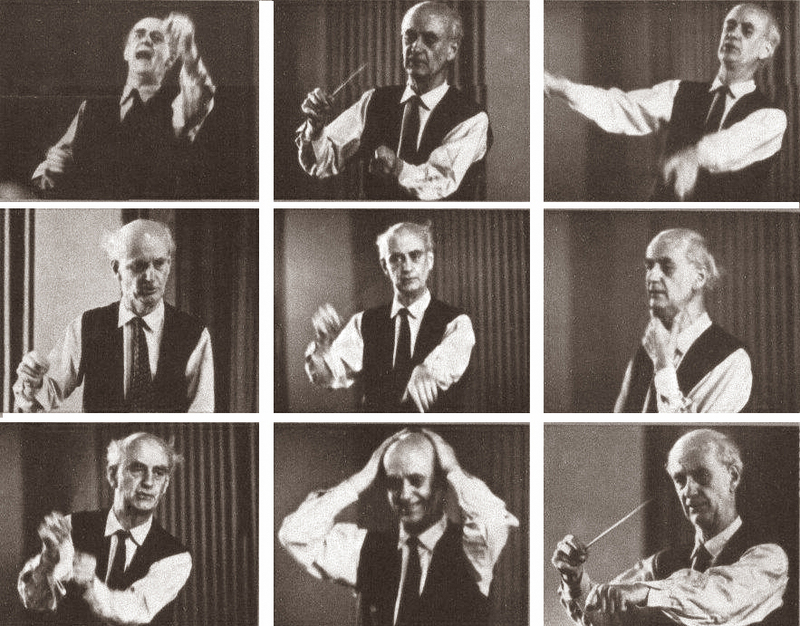 Out goes Bohm, out goes Karajan, out goes Szell. Yes, it hurt, but I had to be realistic. The Norrington set I tossed with relish and glee. God, they were awful. So, I kept one mainstream set — the Bernstein DG set — and one original instruments set — the John Eliot Gardiners — and one set for sentimental reasons, the Barenboim set with the Berliner Staatskapelle. I also came across a set of all of Beethoven’s orchestral music by Nikolaus Harnoncourt, which I simply had to keep, because, well, it’s Harnoncourt. And then, the most recent set of the Nine Symphonies by Mikhail Pletnev and the Russian National Orchestra (currently my favorite set, although this may be a mere flirtation). Oh, and the set of the Liszt piano transcriptions of the Beethoven symphonies. Can’t get rid of that. Around them, there were many individual recordings to keep, too. I won’t mention all of them. But I kept discovering other sets that I kept, and hadn’t even known it. Most of my music is filed chronologically, so all my Bach comes first, all my Haydn followed by all my Mozart, followed by my Beethoven, etc., up through John Adams and Philip Glass. But in a separate bookshelf, I have my extensive collection of historical recordings. I couldn’t get rid of my Toscanini set of Beethoven symphonies, of course. But there are also several sets of Furtwanglers — he recorded the Beethoven symphonies so many times I don’t think anyone has an accurate count. And then, there are the Mengelbergs. Can’t get rid of them; sometimes I think Mengelberg is my favorite conductor. And then, there is the set of acoustic recordings made in the 1920s, conducted by Hans Pfitzner, Oscar Fried and Richard Strauss, dividing the nine symphonies up among themselves. The thing is, when you know such music as intimately as I do (and I don’t claim the intimacy of anyone who has actually performed the music, or those who have studied it relentlessly for years), the music becomes much more than a set of notes, and you know its variations and parameters with something that approaches love, you simply cannot imagine them set down in a single performance any more than you can imagine the woman you love being defined by how she acts on a single day. There is mood, there is growth, there is complexity. Yes, the Beethoven First can be big and overwhelming, the way Klemperer plays it, but it can also be — perhaps should be — Beethoven’s wittiest symphony, as played by David Zinman and the Tonhalle Orchester Zurich. If you haven’t heard that recording, I strongly recommend it: Beethoven taking on Haydn’s game and showing us that he has the chops. Ezra Pound once wrote that anyone who loves the same poetry (or by extension, music) when he is 20 and when he is 40, is an adenoidal idiot. And now past 60, I can add on that while one never quite gives up one’s first love, one constantly finds new loves, not only in repertoire (I didn’t appreciate Bruckner until I was well past 40), but in performance, too. Always something new to discover, always something new to love. My shelves are lined with the love notes of my former lives, and the billets-doux of my senescence. Music is large, it contain multitudes.